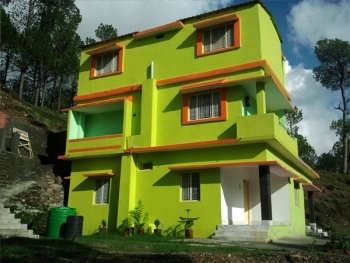 Ajanta guest house is a family run budget hotel in Lansdowne which offers rooms at low cost to the tourists. The hotel is managed by a team of competent and experienced professionals offering warm hospitality and comfortable facilities. Hotel Ajanta is located near lansdowne, just 30 Kms away from Kotdwar on Pauri-Kotdwar Road. The nearest market is at Gumkhal, famous for scenic Himalayan views and pleasure weather. There are 8 spacious and well furnished rooms with attached washroom. The rooms have all the basic amenities to make your stay comfortable. Ajanta Eco Guest House offers various kinds of delicious dishes with some local mouth watering dishes as well. The room rates vary from Rs 1000 to Rs 1500 per day. The guest house can be reach easily by boarding taxi or bus from Kotdwar to Pauri or Gumkhal. It is located before Gumkhal at Pali Bend. Kotdwar is at 200 kms from Delhi and can be reached at 5 hrs driving distance. One can easily board bus from Kashmiri Gate ISBT for Kotdwar. Lansdowne is at 40 kms and Gumkhal is at 35 kms from Kotdwar. Kotdwar is the nearest railway station to reach Lansdowne and one can board trains to Najibabad, a more busy line near Kotdwar (25 kms). Nearest airport is at Jollygrant, Dehradun at 105 kms from Kotdwar.